Greets everyone, I thought I'd show my latest development here for people to give their C&C on, it's not near completion yet but it's the start of things to come. I'm already in the process of updating the grass to cliff blending issue. If there's anything else then please mention. Colour counts are low on each area, I'm also using the same shadow, shade colours to keep editing an easy task. I quite like the classic look it has, and am looking forward to more. other than the stated, the only problem i see is how the diamond-tiled tiles blend. 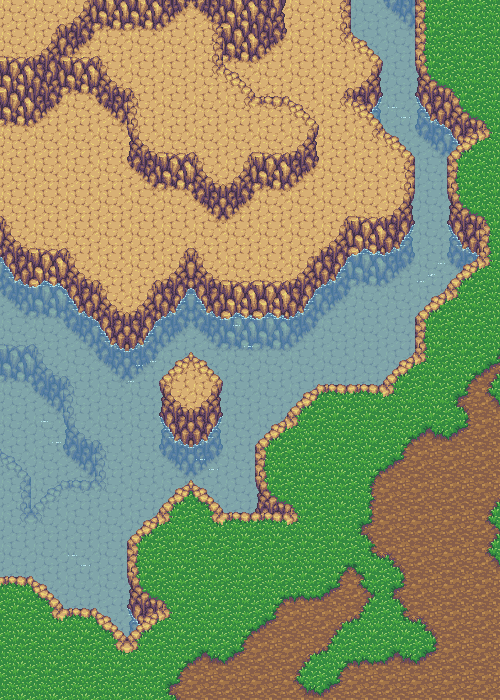 In parallax mapping that that isnt a problem of course. Ah the diamond tiles were only there to show someone who's project this is going to be used within right after completion. Cheers though. I kinda got sick of how the RTP in XP was scattered with pointless colours and VXs are very blurred. I love how the tiles are really detailed, Holder! :) What game is this for? OwO Those are amazing! It's like VS Tilesets for RMXP. I would shed tears of rainbow if I could, these are just amazing!